MSRP: Not listed on web site. 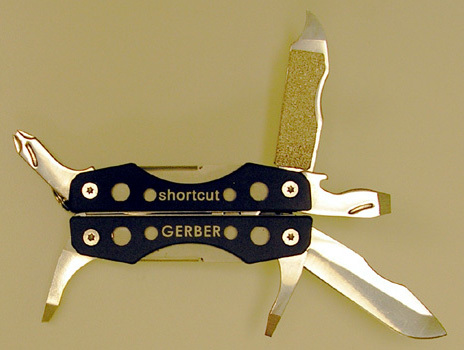 The Gerber Shortcut keychain tool (hereafter called Shortcut or the tool) is a compact multi-tool. 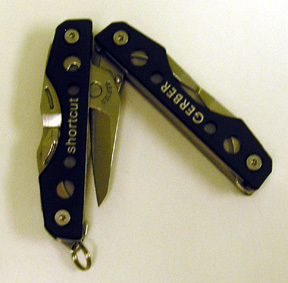 It has dark gray anodized aluminum handles with the Gerber and Shortcut names on one side, as can be seen in the photo above. The handles have been drilled out in eight places, either to reduce weight or visual appeal. A small keychain ring is on one end of the tool. Packed between the handles on the outside of the Shortcut are six stainless steel tools, which are all on display in this picture. They consist of the following, clockwise from the upper left side. A cross-point (Phillips) screwdriver, file/nail cleaner, bottle opener/medium flat screwdriver, 1.75 in (44 mm) knife blade, small flat screwdriver, and a pair of tweezers. As the file and knife look the same when the tool is closed Gerber stamped an identifier on each side. In the first picture in this review the word �blade� can be seen. The opposite side says �nail file�. The handles also hide, protect and enclose clamshell-like a pair of scissors made by Fiskars. The picture to the right shows the way they store in the handle. Once fully opened they snap into place and hold there very well. The blades on them are very sharp. A picture of the fully opened scissors may be found at the end of this review. This little tool has been with me for over 1,000 miles (1,610 km) of hiking/backpacking and two camping trips. It has been as high as 14,496� (4,418 m) elevation and as low as 200� below sea level (-61 m). It has been with me in every month of the calendar in the past two+ years. The item that has seen the most use is the scissors. I am blister prone at the backs of my heels and as soon as I feel one starting try to get moleskin on it. If a blister has already started forming I use molefoam (thicker) and cut a hole out of the center right where the blister is. Thus the scissor use. They are very sharp, even today after over two years of use. I have used the small screwdriver while in the field to tighten the screws on my glacier glasses. The squished Phillips head screwdriver had me thinking �this thing can never work�. Putting it to the test in our office on a few screws proved me wrong. It does grab what the manufacturer calls �crosspoint� screws. I have not needed it in the field though. Nor can I remember ever needing the medium size flat screwdriver. The tweezers work well also. Last year I used them to pull a tick that had latched on to me too securely to get a grip on it with my fingers. The tweezers did the job with no problem. The knife is very sharp. 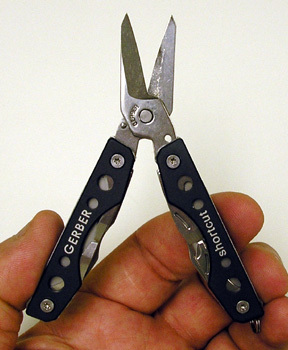 I don�t use it so that it will stay that way as I always have my Gerber Guardian along on almost every trip. 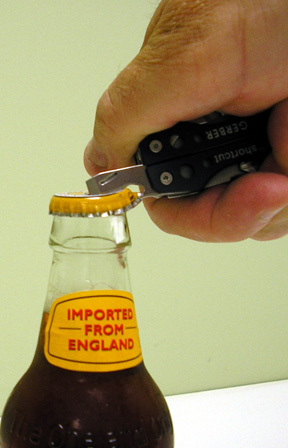 But the most enjoyable tool to use is of course the bottle opener. When the trip is over and we head to the closest hotel for a shower, some real food and a good ale, do you suppose I can find an opener at the hotels? No way! Not in this age of cheap beer in cheap glass bottles with twist off caps. But the Shortcut saves the day, or rather the evening actually. It is on the small side and must be positioned to catch a crimp on the cap just so. But as can be seen here, it works. Yes! All in all it has proved to be a welcome addition to my first aid kit, and hiking gear. I have no dislikes about it. I would not mind seeing the tweezers be a little bit longer.